Jamie Crone made it back-to-back hat-tricks as Little Common Football Club picked up three more points on Saturday. Crone scored all of Common’s goals as they won 3-1 at home to Seaford Town in Macron Store Southern Combination Football League Division One. The speedy striker now has 20 goals in 17 appearances this season and has formed a potent partnership with Lewis Hole, who has 17 goals of his own. 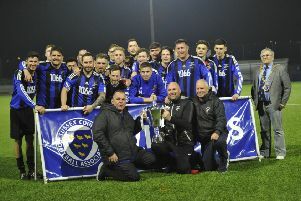 Steve Morris made his first Common appearance of the season at centre-half, while Joe Turner played for just the second time in goal against a second-from-bottom Seaford side. Crone had already pulled a left-foot shot wide of the far post by the time he opened the scoring in the 13th minute. Billy Trickett played a good ball over the top, Hole rounded Seaford goalkeeper Alex Bickham and squared for Crone to tap in from virtually on the line. David Lambert’s angled drive went just wide and Mikey Lloyd brought a save out of Turner, while at the other end, Hole turned Crone’s low cross just over and Trickett’s goalbound header from a Dan Estherby corner was blocked. Seaford might be the lowest scorers in the division, but they conjured up a well-taken equaliser in the 24th minute. Lloyd’s low cross from the left made its way to the edge of the box where Beckham Pout buried a fine left-foot shot. Common went back in front 10 minutes later. Estherby’s cross from the left picked out Crone, whose shot on the turn had just too much on it for the goalkeeper low to his right. The Commoners looked comfortable during the remainder of the first half, but began the second period slowly and Seaford threatened an equaliser on a very heavy playing surface. Talal Altelmesani struck Common’s far post with a terrific effort within 45 seconds of the restart, Lloyd fired just wide from the edge of the box and Lambert’s header from a free kick was held by Turner. But Common gave themselves a two-goal cushion with a goal out of nothing in the 64th minute. Crone outpaced and then shrugged off last defender Josh Tomkins to get on the end of a long ball over the top before slotting past Bickham. Seaford certainly didn’t throw the towel in. Dom Bristow made a crucial last ditch tackle on Lloyd, Turner got just enough on Altelmesani’s shot to enable Russell Eldridge to clear and the Common’s goalkeeper saved Lloyd’s angled shot. It was only really in the last 10 minutes that Common looked completely safe. A well-struck Eldridge free kick was parried by Bickham and Crone volleyed the rebound over, while Crone’s shot following a lovely turn was parried and Hole’s follow-up went beyond the far post. In a lengthy period of added time, Hole had the ball in Seaford’s net only for the referee to rule that he’d kicked the ball out of Bickham’s hands. At the other end, Turner made a good save with his legs to deny Lloyd. Common: Turner, Sherwood (Lusted 60), Bristow, Holden, Morris, Eldridge, Foster, Trickett (Brown 51), Hole, Crone, Estherby (Wells 87). Sub not used: Robb.